How to Check the VIN? Are you dreaming of buying a car but still have doubts about its overall state? Would you like to discover its real type and current specifications in a matter of minutes? No problem! You can do it here, at our website. All you need to do is run a completely VIN Check. In fact, our main goal as a leading online check service is to provide you with the best VIN search tools available at the moment and the latest information about the car you are going to buy. You are sure to get all the necessary info on the car of your choice in the form of a free vehicle history report in a couple of minutes. Why not rely on a VIN search? All smart car buyers and dealers do it. Let our handy tool take your worries away. It is designed especially for this. It will bring you a car report in the blink of the eye. Check yourself! If you want to check the validity of the vehicle’s specs, feel free to discover car history by VIN number. Check car VIN will definitely save you from taking risky and unreasonable decisions when it comes to buying a used car. 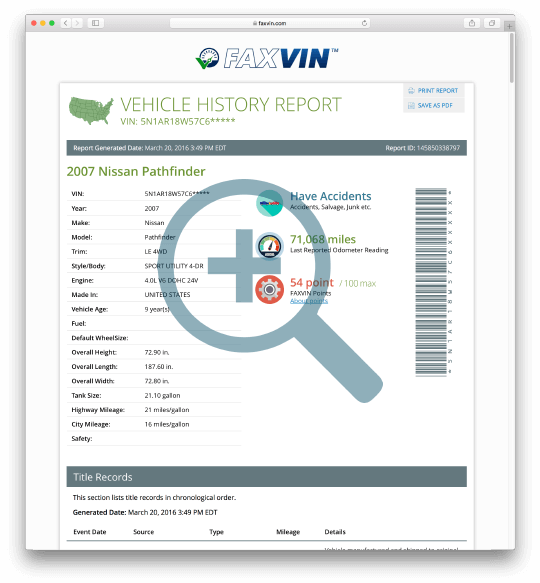 Moreover, if to get deeper into the core of the VIN number check process, you will need to know that the accuracy of the search results depends on the engine and collection of car records that are scanned for getting a vehicle history. That’s why we’ve put great efforts to develop the most effective engine that works with the vehicle data stored in the related data sources that were mentioned above. DMV VIN check. Our services have won the trust of both car sellers and buyers. All the info that we include in our reports is relevant and up-to-date. Thousands of happy customers. Thousands of clients from the U.S. and Canada choose us as a helpful resource to get comprehensive and detailed VIN ID check reports. Over 98% of them say that they are completely happy with the VIN identifying help and data reports that they received using our pro checking tool. Unbiased data. We always provide you with 100% unbiased data as we are interested neither in selling nor buying cars. We are aimed at helping you get a clear picture of the vehicle that you want to check. Free assistance. Yes, you get free reports as we are convinced that everyone should have access to reliable vehicle data sources to avoid unpleasant situations in the future. Find instant VIN search section at the top of this page. Enter the number of the car that you would like to check in the corresponding field. Hit the Check VIN button. Voila, a comprehensive history report on the vehicle of your choice will be given to you in a couple of minutes. All you need to do is to examine it. Checking the car for damages, accidents, mileage rollbacks, repossession and lien records, various defects as well as damages has never been so easy! Grab this exclusive opportunity to get your complete VIN check report based on the info from reliable data sources now!